According to the Woodworking Network, the size of the average garage is steadily increasing. Garages no longer have to be purely utilitarian. You can create customized storage solutions for the ultimate in garage makeovers. Storage cabinets along with custom flooring, updated lighting, and wall organization allows you to keep seasonal items close at hand, increase the value of your home by adding extra living space and eliminate the need for rented storage units. …and who says that a garage has to house only cars and seldom-used junk? Your garage can be a craft room, home gym, a pantry extension, or the ultimate man cave. Cornerstone Cabinet Company experts can create built-in shelves and cabinets for your every need and even install a home bar or utility kitchen for garage entertaining. Popular Slatwall panels and overhead storage cabinets can also be constructed to house specialized equipment. Even if Mom wants a laundry station and Dad wants a workbench, both can be customized to form one cohesive design concept in this large, open space. 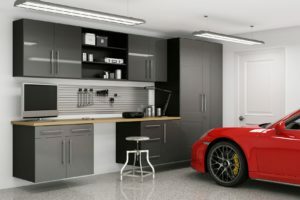 When choosing cabinetry for the garage, the best options include melamine laminated on MDF or plywood, injection-molded resin, or steel. However, laminated cabinets may not hold up well if your garage gets a lot of use or is exposed to frequent moisture. Hanging cabinets of all materials reduce the likelihood of moisture transfer from the garage floor. Hanging cabinets also ensure that they will be level and open perfectly because there is often a slight downward pitch to the floor of a garage that diverts water toward the outer doors. Well-fitted cabinetry protects belongings by keeping out dust and pests and cedar lining is a must for keeping stored clothing fresh. Note that sliding cabinet doors make access easier than swinging doors when a car is parked nearby, as well. Cornerstone Cabinet Company partners with innovative companies like Hafele and Rev-A-Shelf for the best quality cabinet accessories and cleverest storage solutions. Transform your garage into fun, functional home extension today!